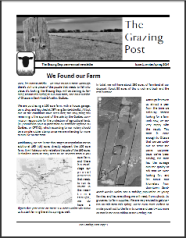 Grazing Days is pleased to launch the Grazing Post—a semi-annual newsletter for everyone in the Grazing Days farm community. Although we deliver tasty beef to many of your homes, the two minute interaction doesn’t really give us a chance to share a full farm update nor to talk about the issues the farm is facing. Hopefully the Grazing Post will help fill this gap and provide us with a venue to share the latest and greatest, and provide you with an opportunity to find out more about what’s happening behind the scenes at Grazing Days.